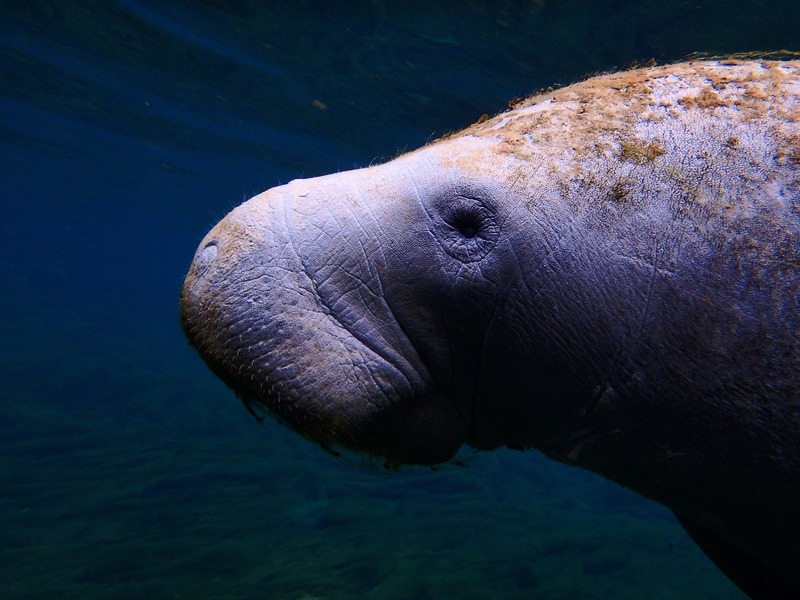 November is Manatee Awareness Month, an annual event that seeks to raise public awareness of the continuing threats faced by these beloved but endangered marine mammals. A manatee, often called sea cow, is a large aquatic animal, which is a relative of the elephant. 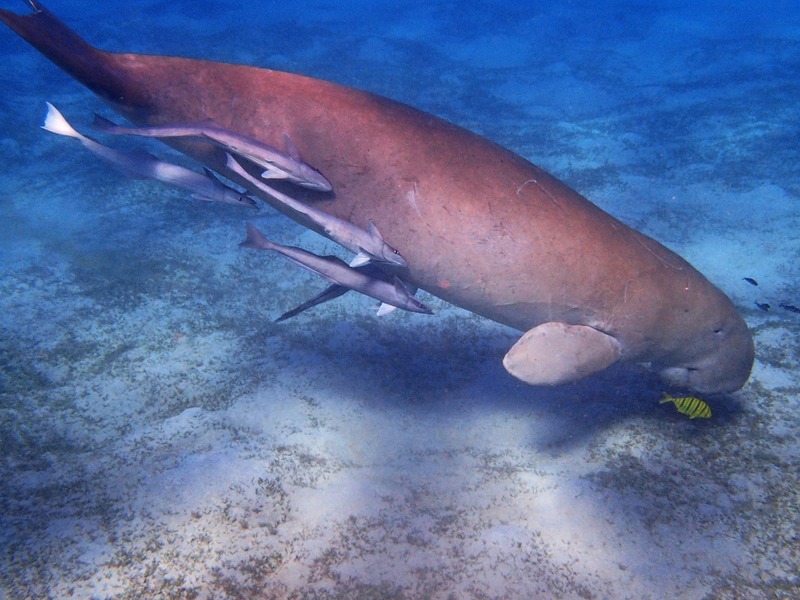 Manatees feed on plants such as sea grass in shallow and warm coastal areas. These gentle giants of the sea do not have natural predators but face serious threats from human activity. In the waters of Florida where many of them live, for the past five years, watercraft-related incidents have killed more than 80 manatees each year. In 2009 alone, 97 manatees perished while others were seriously injured due to collisions with boats. Experts believe that if the manatee death rate remains high, the population of these marine animals may not recover. Another problem manatees face is habitat loss. These sea creatures require warm waters to survive. However, in Florida, manatees have been forced to stay in colder waters where they eventually suffer from stress leading to their death. This is because some of the warm natural springs they used to inhabit have been destroyed due to groundwater pumping for urban and residential development. With all the serious threats they face, manatees are already considered an endangered species. Experts say there are only some 6,000 manatees left in Florida. This year’s observance of Manatee Awareness Month gives us the opportunity to join in the efforts to protect and save these amazing sea creatures. Here are some of the ways you can contribute to ensure the survival of the manatees in our country’s waters. Learn more about these gentle sea cows. If you live in a place where manatees live, go out and educate people on how to avoid harming them. No boat speeding and watch out for these slow-moving sea creatures. By going slow and reducing your boat speed, you can greatly reduce the chances of collisions. Advise other boaters to do the same. Join a local sea conservation organization. Alert the authorities if you see any intentional harm being done by some people to manatees. If we can exert efforts to save the manatees, it’s more compelling to do the same to our fellow humans who also face survival problems. They include the men and women in our community who are saddled with disabilities, illiteracy, welfare dependency, past criminal records, and other personal disadvantages that prevent them from accessing opportunities for gainful employment and living a life free from poverty. You can easily provide life-transforming assistance to these individuals by donating a car or a truck or any other type of vehicle that you no longer need to us at Goodwill Car Donations. We will transform your donated vehicle into a financial resource to help these disadvantaged people regain their dignity by harnessing their full potential. We sell at auction all vehicles donated to us and use the proceeds to support the critical community-based programs of the Goodwill nonprofit organizations serving your area that cater to disadvantaged individuals. With this funding, our nonprofits are able to provide our beneficiaries with services such as skills and job training, career development and placement, scholarships, youth employment, livelihood, disability benefits support, and other community-building support. Those who enroll in our job training programs are taught specialized skills that suit their condition, enabling them to qualify for decent and stable jobs. With the wages they receive, they become financially independent and able to take care of themselves and their family. However, the deserving less privileged people in your community will not be the only ones who will benefit from your vehicle donation. As a matter of fact, you, too, will get to receive your own share of rewards, including a maximum tax deduction based on the selling price of your donated vehicle. For more information on Goodwill Car Donations, our donation process and other related matters, check out our FAQs page. For inquiries, give us a call at our toll-free hotline 866-233-8586 or send us your message online. You can make your car donation by either calling us directly or filling out our online donation form, which you can find on the right side of this page. This Manatee Awareness Month, let’s not only help secure the lives of the manatees that inhabit our coasts but also our less fortunate fellow Americans who live among us. Call us at 866-233-8586 and get free professional towing service for your vehicle donation.